What better way to visit Paris than by bike? Relatively flat, the capital is perfect for a bicycle tour. Follow the guide to find out how to (re) discover Paris by bike! The city of lights has seen its number of cyclists constantly increase in recent years. Vélib, bike rental or your own bicycle, you can stride along the 371 km (230 odd miles) of bike routes and its 11 bike trails. Paris continues to develop new routes for cyclists and organizes events to encourage the use of environmentally friendly transport. A “car-free day” is organized every autumn since 2015, during which cars disappear from the streets of Paris and fill up with cyclists and pedestrians. On top of that, every first Sunday of the month, the “Paris breathes” initiative turns the centre of Paris into a pedestrian zone open only to public transport and soft traffic. 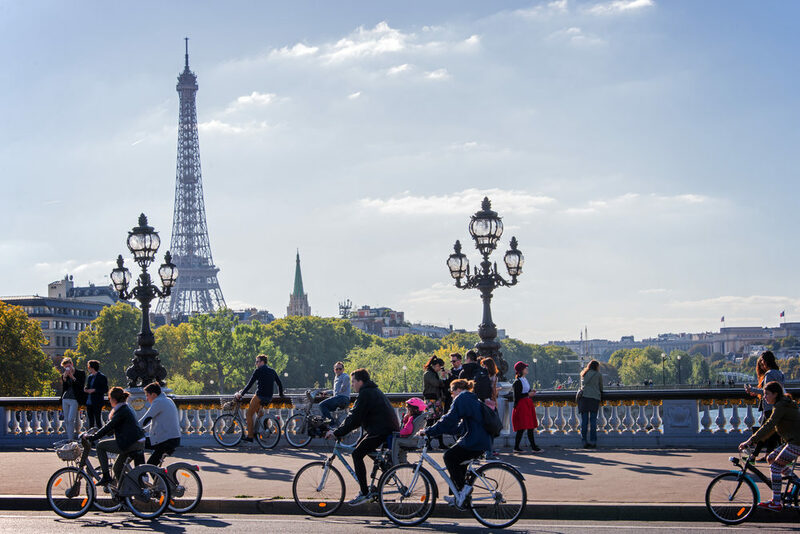 What could be better than cycling along the Seine and stopping regularly to contemplate the historic monuments that line the famous Parisian river? Start on the Champs Elysees, Place de l’Alma, and keep going to the bridge Alexandre III. Once you get to Place de la Concorde, stride along the Seine by the Jardin des Tuileries. Feast your eyes on the Musée d’Orsay, then the Louvre. Finally, head for Notre-Dame-de-Paris, before finishing the tour on the Hotel de Ville square. If you’re looking for a more environmentally friendly route, away from traffic and horn blasts, we have just the thing. Tucked away in the twelfth arrondissement lies the start of a trail relatively unknown by mass tourism, called “la Coulée verte” (the Greenway). This trail, which can used by foot as well as by bike, extends over 4.5 km between Bastille and the Bois de Vincennes. You can go all the way to Château de Vincennes, and finish at the beautiful Parc Floral de Paris, while remaining in the Bois de Vincennes. Want to spend a truly unique stay in Paris? Aloha Hostel helps you plan your trip. Contact our agents!